A fitting return to form for Nintendo, known for harbouring the likes of Castlevania back in the day, developer 7Levels has created a fun 2.5D action platformer in Castle of Hearts, and it’s great to see it as a Switch exclusive. It’s nowhere near the calibre of the games it’s inspired by in terms of gameplay, but it has some good ideas that kept me entertained and wanting to push through the frustration to see the end. Official artwork. Character design in this game seems to take a leaf out of the Dark Souls book, and it looks very cool. 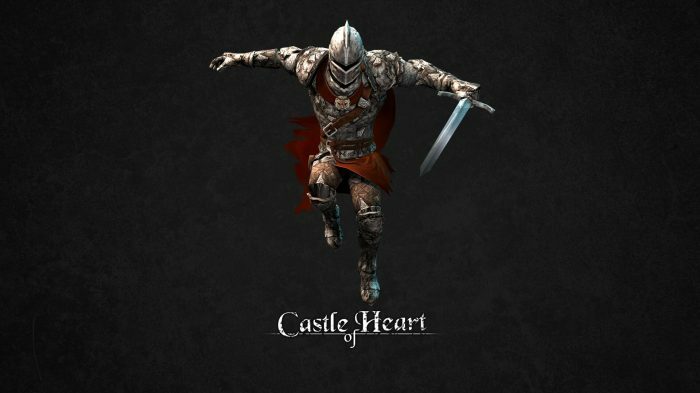 A knight setting on a 20 level quest to save his love from evil, Castle of Heart has the cheesy, cliché story that you would expect from this genre of game. Aside from a few bits of dialogue here and there, it’s largely a challenging slash-fest to victory, and that’s totally fine. What it does provide is an interesting game mechanic, in the form of the literally stone faced playable character. Turned to stone by a curse, your character’s health is constantly deteriorating throughout play, forcing you to balance carefully timing your attacks and rushing to the next checkpoint. It gives the game some real strategy, especially within the 4 boss battles, which prove testing of your ability to know when to strike and when to dodge. Take too many hits or run out of time and you’ll crumble to the ground ‘like crisps under bison’. I love The Mighty Boosh. Complementing the game’s stone mechanic and a pretty satisfying amount of executable moves is a myriad of different weaponry that you can dual-wield alongside your rather pitiful sword (which becomes pretty redundant as the enemies improve). My personal favourites were the spears and flaming crossbows, allowing to pick off enemies from range. If you’re clever, you can even use the environment to your advantage, knocking down spikes and torches on enemies to help you in combat. 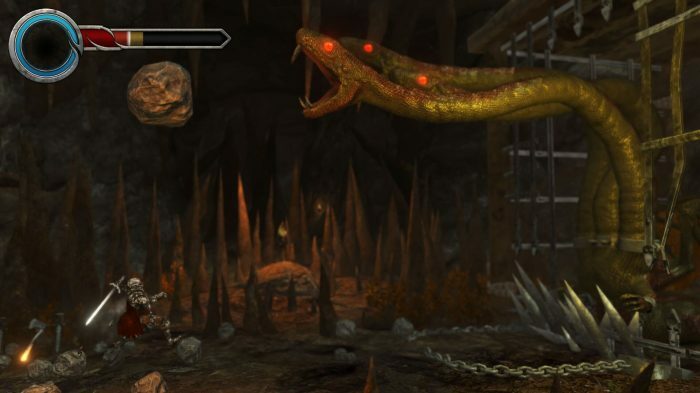 One of the games’ four boss battles. This took longer than I would have liked. 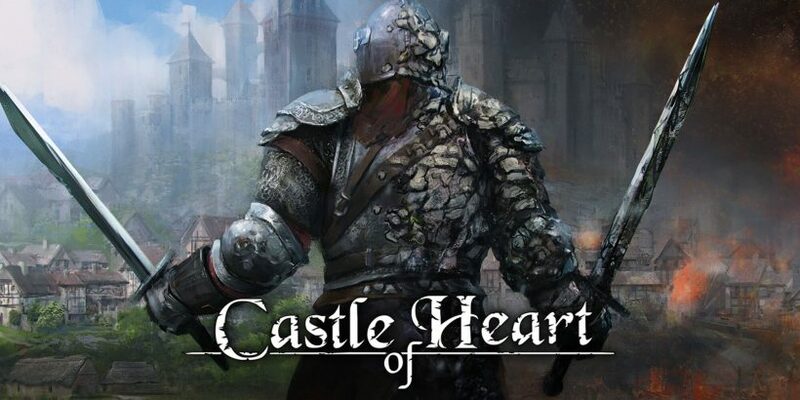 Castle of Heart stumbles in a few ways that typically make these sorts of games great. The character movement feels sluggish, and not in a “I’m made out of stone” sort of way. By the end of the game I’d managed to get to grips with the weighted jumps and platforming, and some of the castle walls levels and platforming even reminded me of the infamous ‘slippery climb’ from Crash Bandicoot, but I often felt there was no way of avoiding being hit in certain situations, and by the end it feels like you’re just being spammed with enemies to create a synthetic difficulty spike. This is not ideal for a genre that hinges on pinpoint accuracy and satisfying platforming. The game is pleasing visually, and there’s some nice environmental variety, but specifically in the earlier stages I found myself having to focus intently on the screen to see what exactly was happening, as it was a bit of a muddle of colours. This is even more of an issue in handheld mode. The music is also grating and annoying, repeating the same blunt tracks across multiple stages. These snow levels in chapter 3 provide a nice environmental change. I hate these birds. Castle of Hearts isn’t a great game, but I’d be lying if I said I didn’t have fun with it. If you like the look of the screens and fancy a challenge, I’d say it’s worth a go. 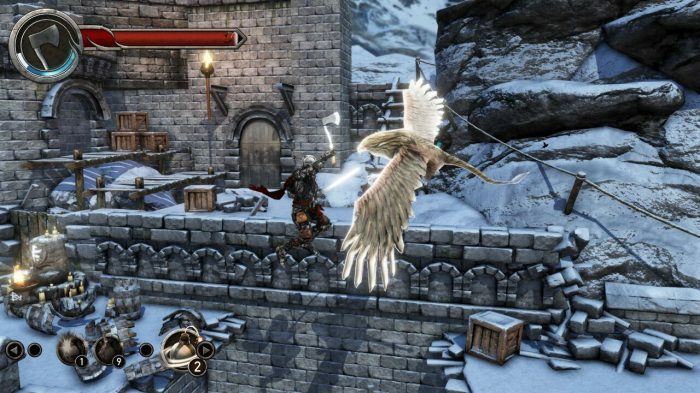 Castle of Heart is a fun console exclusive platformer that harks back to classics such as Castlevania and Ghosts ‘n Goblins. It’s a tad bland and repetitive, but it’s worth checking out if you fancy testing your patience with a sword in hand.